A frequent question I get asked is “What headphones do you wear for running?” For years I would always get an inexpensive pair from TJ Maxx or Marshalls that would last me about 6 months. Which, worked for me at the time… and trust me when I say I love my TJ finds, but it just got old after a while. After hearing a lot of hype around Aftershokz, I decided to give them a whirl. I love testing things out thoroughly before giving my opinion, so my thoughts are based on using them for about 2 weeks! What initially intrigued me about this style of headphones was it was different than what I’ve been using. I’ve only used earbuds, so I was interested to see how the style compared to what you see out on the market. I was surprised to find out that even with having smaller ears, they fit really well! 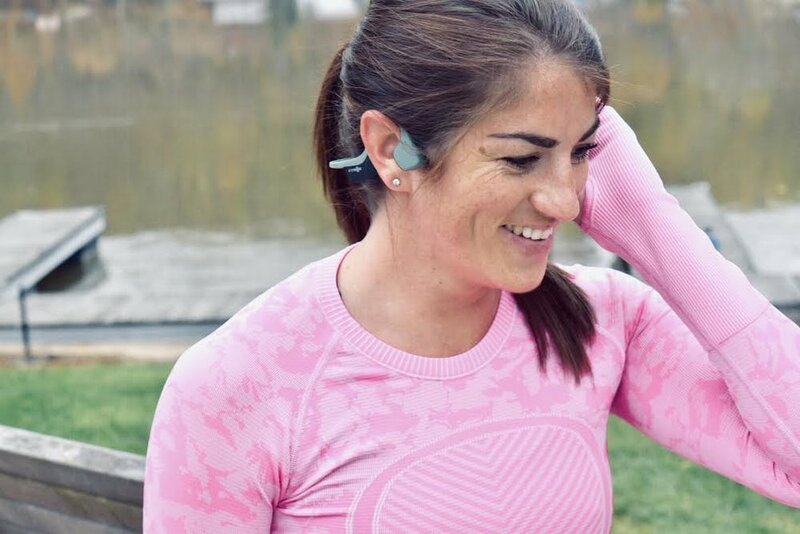 #PREACH They also have a lot of user friendly features from being able to shuffle your playlist mid run (my other wireless headphones don’t have that feature, so I was all about it! ), to answering calls, and more. The technology is what really sets them apart from anything I’ve ever used. As you can see in my picture above (me wearing the headphones), the headphones aren’t in my ears. Instead they sit on the outer ear area, while still delivering quality sound. The reason why I personally liked this feature is because when I’m running more often, I’m not always in the mood to be “tunnel vision” with my music. And yes, I occasionally go no headphones all together… but usually my next step is throwing my phone in my Koala Clip or bra pocket and play the music out loud. I like the balance of hearing my surroundings, but still jamming out. I will say that these headphones do help you achieve that feeling, which is pretty cool. Now for the fun part! Like I said, I tested these out for a couple of weeks. Short runs, long runs, recovery runs, tempo runs. I DID IT ALL. Very comfortable on all levels. Keep in mind my long runs are for about 90 minutes as of now, and I ran into (haha, get it?) no issues when it came to battery life (they would last for several days before needing to recharge them). So, my grade for this product is a solid A. Whether you’re a runner, walker, hiker, etc. I would say they’re definitely worth the investment. What’s nice too is they’re going to be sold at a discounted price this Black Friday in addition to offering a special BOGO deal this holiday season! With every order of Trekz Air or Trekz Titanium headphones, between November 23-November 26 (while supplies last) you’ll receive a free open-boxed pair of Trekz Titanium Slate Grey to gift to someone! When I got mine a few weeks back, I got an extra set and decided to gift them to my friend Pamela! (Watch the video below to learn more about Pamela, and why I was so excited to do this for her)! Let me know if you have any additional questions about the headphones, the Black Friday and/or BOGO sale, or anything else! After running 7 full marathons, this is what I wish I knew going into my first one! Running can be difficult. We all know that. But running while pregnant... now that can be HARD! There's no question about it. You're carrying extra weight. You're extra tired. Your legs might be swollen. You may have random heartburn. You're most likely nauseous. And the list can go on and on. BUT, just because you're pregnant, it doesn't mean these things have to stop you from running! Are you drinking enough water if you are pregnant, running, and it’s hot out?! Think of water like oil for your car. It helps keep everything working and moving properly. It’s important to hydrate because water helps transport key nutrients and all the goodies to the baby. Obviously very important! Are You In The Right Running Shoe? Having the right footwear while running is a must. Now, we're not saying you have to have the most expensive shoe out on the market, but you do have to have the right shoe. Each runner has their own individual gait (how you walk). You may or may not know this, but most companies make shoes to properly support those different gaits!